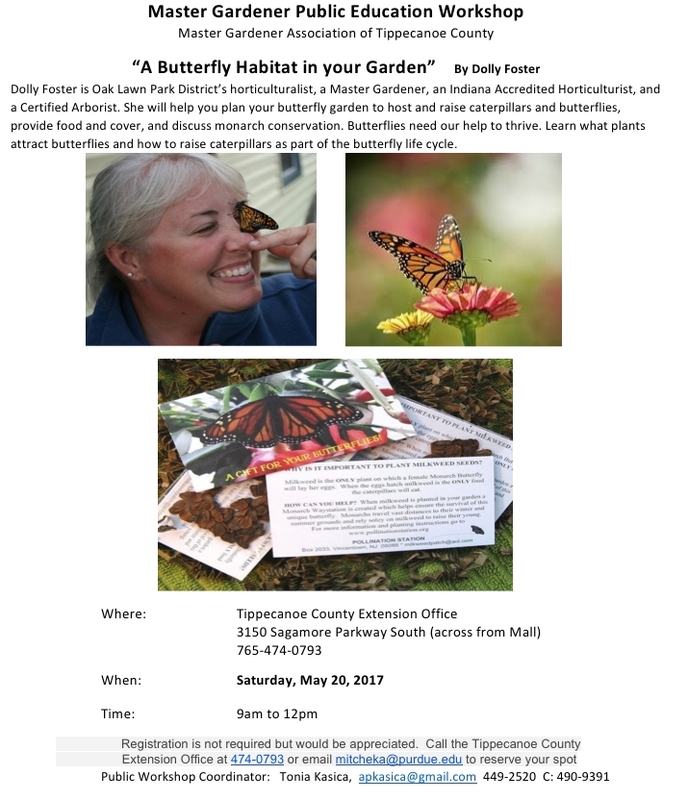 Workshops are free and open to the public and are held at the Tippecanoe County Extension Office 3150 Sagamore Parkway South in Lafayette, just south of the Tippecanoe Mall. Registration is not required but would be appreciated. Call the Tippecanoe County Extension Office at 474-0793 or email mitcheka@purdue.edu to reserve your spot. 1. "A Beekeeper's Year...What it takes to keep honeybees"
or contact Karen Mitchell at 765-474-0793 mitcheka@purdue.edu on or before February 22 2017. 1. Topic: “Basics of Landscape Design” Presentation will cover the design process, the features and principles in landscape design, and how to apply this knowledge. Also, handout about companion plants. Ian Thompson Rae will talk on edible landscaping as it relates to land, soil, plant materials, sustainable communities, supporting urban farmers, and the urban farmer’s co-op. Ian will talk about Tippecanoe Urban Farmers, their philosophy, their purpose, how they got started, when they get together, benefits of urban gardening, where they plant, what they plant, and their success. If you love irises, you won’t want to miss this presentation. Not just a hobby for these two; well, maybe a hobby that grew into a love for growing and hybridizing irises. Additionally, Chuck has been a judge at iris shows for 15 years. They will also be telling us about an international iris event right here in 2017. Meeting follows - NOTE: This is a Monday meeting.